Hi, I am interested in your 1973 Chevrolet Camaro (stock #1704-TPA) listed on Autotrader for $34,995. I'd like to get more information about this vehicle and confirm its availability. 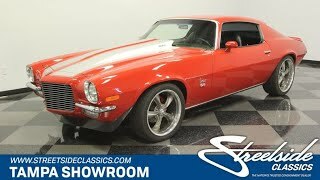 This slick 1973 Chevrolet Camaro SS has upgraded fuel-injected big block power and four-wheel disc brakes. But just because this is a brutal street machine doesnt mean you miss out on comforts, like the A/C interior. That red really grabs your attention, doesnt it? It looks almost like the 1973 Medium Red, except a shade richer and a slick shine that comes from a modern clearcoat. The color fits in with the Camaro crowd, and yet it remains distinct at the same time. The same goes for the iconic Z/28-style stripes that are finished in a distinct silver. These also accent the massive cowl induction hood and spoiler that runs end-to-end over the rear. The bumpers look freshly dipped, and they served to highlight some of the best features of the car. In the rear, the mirror-like shine draws even more attention to the blacked-out rear panel. And up front, the bumpers and upgraded billet out all eyes on the RS-style open front that made these 2nd gen Camaro in-demand icons. The whole package is finished off with details like hood pins, a deep chin spoiler and Boss alloys with an aggressive 18/20-inch front/rear stagger. So this is an intimidating coupe from every angle. At first glance, the clean full black interior look very stock. You get high-back bucket seats, grippy NK4 steering wheel, a center console, and the iconic horseshoe shifter. And you can tell by the freshness of places like the dash pad and carpeting that they spent money on factory replacements. But then you start to see the investments have gone well-beyond the factory look. Youve got modern upgrades like LED lighting, an AM/FM/CD stereo, and cold-blowing R134a air conditioning. Plus, those white-faced gauges with glowing red accents tell you theres something special under the hood, too. The engine bay is filled with 396 cubic-inches of big block V8. In fact, some of your favorite shining pieces are also some of the best supporting components, like the upgraded billet pulleys, steel-braided hose, and mirror-like shroud that covers the aluminum radiator. But what youre really interested in is all the power this creates. This big block has been enhanced with Holley fuel-injection, an Edelbrock intake, and MSD ignition. It makes a wicked snarl from the H-pipe dual exhaust. Making sure you have the best control over all this power are great upgrades like the grip of modern Cooper Zeon tires and drilled & slotted four-wheel disc brakes. Plus, this muscle machine has easy driving features like power steering and a stout TH400 three-speed automatic transmission. This is a fuel-injected big block classic Camaro finished with all the right upgrades. So you know a dream car like this will be going soon. Call today!! !